The Data is in: Tactical Urbanism Works in Fayetteville, AR! In November of 2016, Street Plans worked with the City of Fayetteville as one of six “Beta City” partners associated with the Tactical Urbanist’s Guide to Materials and Design. To further test the Tactical Urbanism approach, the City installed a pilot roundabout from February to March of 2017. 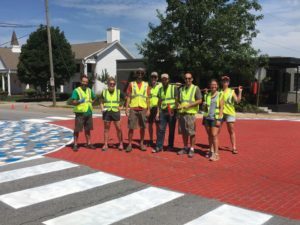 The City of Fayetteville then launched an official Tactical Urbanism program that allows citizens to apply for a permit to install their own short-term place-making projects. The first two projects–which included added stop signs, curb extensions, and crosswalks–were approved and built in July and August of 2017. To add visibility and playfulness, the curb extensions and crosswalks included colorful pavement art. The City then reviewed the projects in January of 2018 and the data showed that the pilot traffic-calming projects worked! For both projects, the percentage of speeding cars reduced from 7% to 1%. 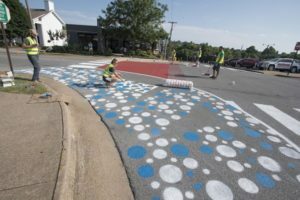 Given the short-term, experimental nature of the projects, a few tweaks will be made going forward, but the City of Fayetteville plans to make them permanent. Click here to read more about the project results.